There are lots of pains and trials with aging, there is no doubt about that. But as each day goes by, I am finding more and more magical things that make me grateful as I get older. It’s so much a matter of attitude. It’s easier to “Slow down and smell the roses,” because I just can’t go as fast anymore. I’m also discovering that multi tasking (a talent which I actually used to be proud of) is a waste of time in the long run, in that it means that I was never fully engaged in any one thing as my brain spun to “keep all the plates in the air spinning.” Today, when I focus on one thing or person at a time, it’s deeper, richer, and makes each moment memorable. People mean even more to me. I’m a “people person”, so people ALWAYS mattered a lot. But now, they matter an ENORMOUS amount. I think it’s because with the passing of life, I’ve had the pain of grief in losing many people who meant a lot. I see how fragile life is. I’m absolutely aware of the value of those I love every single day. I cherish and enjoy them even more, without judgment, giving advice, or wanting to change them. I am loving people just as they are these days. Priorities have changed. Love and family and friends come first. I still love to write. I still love to teach. I still have hobbies and interests and a “to do list”. But I know what comes first, and that feels good. I have a bevy of grandkids today, and I find total joy in watching them learn and grow and laugh and explore. I like the feeling of delight many years of life wisdom bring. Sometimes I marvel at how much I used to worry, to wonder how my life would turn out. I was full of self criticism and self consciousness. I hesitated and procrastinated so many times in life, wanting to wait until I was “better” or “improved” to face a challenge. I would procrastinate until I was “more skilled, or thinner, or richer, or had more time”. Getting older has taught me a lot about this. No sense wasting time waiting for perfection. Today is the day I have, so I better accept myself as I am, and live life to the best of my ability. Now. This one change has opened so many opportunities. I have taken flying lessons, taken part in a fashion show (if you know me, you know how off the charts this is), gotten bilateral knee replacements, and embarked on a whole new life. I’ve learned that we’re never too old to experience life in a rich and amazing and different way. Including love. I’m including a link to a short fictional story about finding love in the second half of life. I hope you enjoy it! What have you learned as the years go by? I’d love to hear! 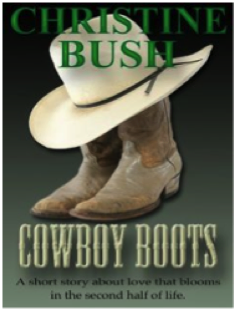 Enjoy “Cowboy Boots”, a short romance story about finding love in the second half of life. Christine's latest book is “Cindy’s Prince”. You're right about people mattering more. I can't believe how hard it has been to adjust schedules to make them a priority without letting everything else go. But in the end, it's only the people who are important. Very nice post. I've learned pretty much the same things you have. For me, God and family and friends are number one. People are what matter, not things. The one great thing about aging IS wisdom.